Many antique razor collectors build their collections around straight razors of the 18th and 19th centuries. A few collectors search for razors that date back to much earlier times. Other razor collectors argue the definition of the word antique, and collect razors that may be considered vintage by some. Yet all of these collectors have one thing in common, the love of collecting an important part of barberiana. Barberiana, the term given to collectible items that have to do with shaving, encompasses razors from the earliest times to the present. However, a question often arises as to what actually is an antique. It is often said that a piece has to be one hundred years old to be called an antique. Many collectors argue against the validity of the one hundred-year old rule, which was put into place by a United States customs law. These collectors believe that to be an antique, an item simply has to belong to the past and be desirable because of its age, uniqueness and rarity. In reality, collectors throughout the world repeatedly refer to items that are less then one hundred years old as antiques. Scientists have proven that shaving and razors date as far back as to the days of the cavemen. Archeologists have found caves with pictures of crudely drawn men with very short beards, and other men that were beardless. Early razors made of horn, flint or stone with bone handles have been excavated from these caves and scientifically carbon tested. The results of the tests date these early razors as being from the Neolithic Period. The ancient razors from the Late Stone Age slowly evolved, and by 3000 B.C. hieroglyphics and tomb excavations show that the people of Mesopotamia were shaving with finely honed obsidian blades. As centuries passed, shaving implements were continually being developed and improved, and straight razors with forged steel blades came into fashion. 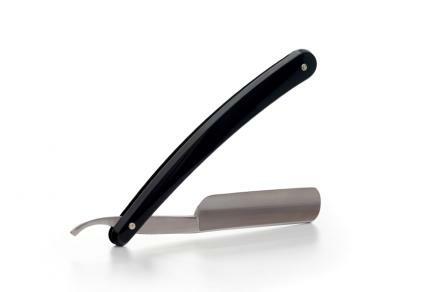 In the late 1700s a variation of the straight razor, which added an L shaped wooden guard, was introduced by Jean-Jacques Perrot. Although it went through many changes, Perrot's antique razor became the prototype for the first safety razor. Throughout the early 1800s inventors were continually trying to improve the safety of the straight razor. In 1847, an Englishman, William Henson, set the razor's blade perpendicular to the handle, and this style razor quickly became a huge success. Commonly referred to as a hoe type razor, Hensen's invention became the forerunner of the style of the razors used by most people today. The 1900's brought about major changes in the razor industry. 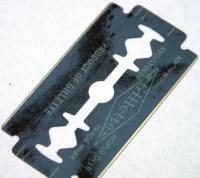 In 1901, King Camp Gillette patented a new style razor blade that would change razors forever. The new blade was not forged; instead it was cut from a template, disposable and sharpened on both sides. The introduction of the electric razor in 1939 by the Schick company was another big step for the razor industry. Collectors of antique razors who treasure straight razors often have a nostalgic feeling of bygone days associated with their collections. For example, it was common for wealthy gentlemen of the 18th and 19th centuries to have servants that would shave them. These gentlemen would purchase numbered sets of straight razors which contained between two to seven razors. The gentleman's valet would make sure to have the razors well sharpened before shaving the gentleman. These razor sets are highly sought after by today's antique straight razor collectors. Manufactured in many countries including England and Germany, straight razors often had blades and handles that were adorned with intricate scrolled etchings. Collectors find the artwork very desirable, adding value to the razor. Many collectors also look for razors with handles made of a specific material such as gold, silver, mother-of-pearl, celluloid, Bakelite, bone, wood and tortoise shell. Some razors will have marks that can be used to identify the manufacturer and country of origin. The material that is used for the handle of the razor will help to determine its age. For example, a celluloid handle will most likely date a razor from 1890 - 1930. Some straight razor manufacturers used identifiable artwork on their handles or blades. Although not many antique razor collectors can find razors used more than 250 years ago, razors from the last two and a half centuries can readily be found in antique shops, auctions and private collections. Whether you collect straight razors, safety razors, or early electric razors, the fun of collecting can be enjoyed by everyone.